While on routine patrol, Captain Jean-Luc Picard gets word from Starfleet Headquarters that the Borg, an insidious race of half-machine, half-organic aliens, have entered Federation Space and are on a direct course for Earth. Violating direct orders to remain uninvolved, Picard leads the newly commissioned Enterprise E into Starfleet's massive assault against their deadliest foe. After the attack on Earth fails, the Borg institute a plan to go back in time to Earth at its most vulnerable time in history, the dark age after the Third World War. 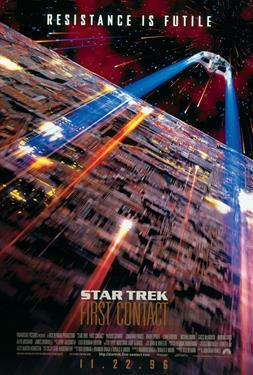 The crew of the Enterprise follow the Borg back to a missle complex in Montana. The date: April 4, 2063, the day before the legendary flight of Zefram Cochrane's warp drive rocket, the Phoenix. This historic flight would ultimately lead to the initial meeting between humans and beings from another world and subsequently, the birth of the United Federation of Planets. It is this "first contact" that the Borg are trying to prevent.